Born and raised in Ras Al Khaimah, Emirati poet Ahmad al Assam is the subject of a new documentary by award-winning filmmaker Becky Beamer from the College of Architecture, Art and Design (CAAD) at American University of Sharjah (AUS). The film, entitled Aminah, unveils the life and inspiration of the acclaimed poet through a series of conversations and explorations set within the neighborhood and shores of old Ras Al Khaimah. “Aminah is a dialog between a poet, a critic and an emirate. It is an experimental biography of poet Ahmad al Assam who has lived his entire life in Ras Al Khaimah. My film invites the audience to ride along with Ahmad al Assam as he shares the intimate spaces around Ras Al Khaimah that have inspired his discourse on family, loss, love and country,” said Beamer. “The environment, culture and people are the catalysts for his poems that depict a greater narrative on the inevitable—change. 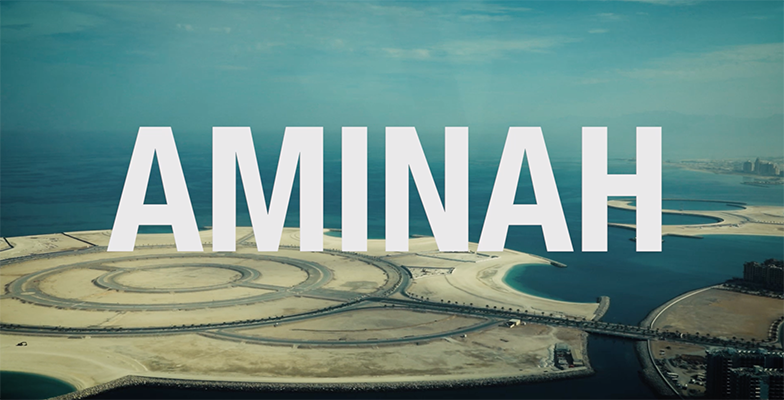 Throughout the film, the poet shares his stories in verse and prose, and as we view Ras Al Khaimah from the sky, we hear the words that are echoed in the sea, and feel the passion of critic Dr. Haitham Yehia Al-Khawajah, who refused to give up on the importance of poetry to Ras Al Khaimah and to the region,” Beamer said. Beamer, who has been the recipient of international awards for her documentary film work, was able to create Aminah with a grant from The Sheikh Saud bin Saqr Al Qasimi Foundation for Policy Research as part of the Ras Al Khaimah Fine Arts Film (RAKFAF) Festival. “The grant allowed me to personally explore RAK in a way I couldn't do without their support. I hope that the film Aminah will be able to bring communities together with a new point of view on poetry in the region and allow insight for the public into the mind and process of an artist not easily accessible to all,” she said. “The short documentary was inspired by my observations to the importance of poetry in the region and my curiosity to explore rapid changes in the environment and social culture over time. As an outsider, I hope to add a new point of reference to these topics through documentation of one poet's story and poetry. These are important and relevant issues to society today,” said Beamer. Aminah premiered as part of this year’s Ras Al Khaimah Fine Arts Film (RAKFAF) Festival in February, offering the audience the opportunity to meet both the filmmaker and the poet and ask them about the process in creating the film. “The premiere was in one word ‘magical’. The National Museum courtyard in Ras Al Khaimah was packed for the premiere, and it was a wonderful privilege to be able to share my motivations for the film with the audience after the screening,” she said. “My dream is to inspire a range of voices from the region to use the platform of documentary film to share and document stories important to capture today. I am hoping that Aminah will be part of film festivals in the region and abroad in the future, and I do welcome collaborations and screenings in the local community that would offer an opportunity for the greatest number of persons to view the film,” she said. Beamer’s documentary work first saw her working in television for over 15 years for organizations such as National Geographic, Smithsonian, Discovery and PBS. She is an Assistant Professor of Art and Design teaching multimedia, art and film to students at AUS; she is also a book artist and a Fulbright Fellow. For more information about the College of Architecture, Art and Design and its talented faculty and students, visit www.aus.edu/caad.